One sight of sunset at Kalamitsi Beach in Lefkada Island can stay in the thoughts for weeks. It happens once each day, but no two are alike. For the lucky few that witness it in the relaxed atmosphere of ocean breezes, it is simply beautiful. There are other beaches nearby, and in fairness, each has a claim to a unique beauty. Picking one is a little like picking a favorite star, yet many tourists pick Kalamitsi Beach, on little Lefkada Island, in Greece. 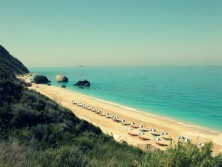 Kalamitsi is a small beach compared to others nearby, and it has white sand & crystal-clear waters on the Ionian sea. The most prominent features on the beach are the rocks that have taken on shapes from centuries of wind and water. The elements have hollowed one to make an arch; others seem to stand in the surf and sun like monuments. They add a certain untouched and natural appearance to the beach. On breezy days, the surf channels in an around the rocks with sprays and delightful displays of wind and water. Even in a paradise like Kalamitsi Beach of Lefkada, one has to eat and find sumptuous places to enjoy the nightlife. There is plenty to do and see besides just enjoying the beach. Located only 15 km from the main island town, one can enjoy fabulous Greek style cooking and regional wines. The Village is a scenic place; it has thirteen windmills and some well-known historical sights such as the old church, the “Panagia stous Kipous” (Παναγιά στους Κήπους). The small village sits on a wide slope that provides an unspoiled panorama of the sea and shore. It is an old village built on the mountain slope as a defense against pirates. At the beach, one should carefully decide when to swim, and when simply to enjoy the sun and surf. There are often winds and active surf conditions, which would tend against swimming. The beach is natural, and there are no permanent chairs or sun covers. It is a splendid place to enjoy the sun and the peaceful sounds of waters, sand, and the magnificent stones. In the calm hours, the crystal waters will require no invitation. Away from the beach, there are many sights to take in on the island including boat tours through sea caverns and air tours to see the entire island in a few hours. Kalamitsi, without a doubt, is a place you should visit if you have the opportunity. Dear, do you have some special offers for 10 nights accomodation for 4 people from August 3rd? What’s the price for double room in this period?